Adventurous-definitly will be able to play a game with you! Secretive-a ninja like puffle, blending in with the snow! Intelligent-a book worm by choice, will love to spread the knowledge to the world! Crazy-so maybe it fell off a snow bank when it was young.. but it sure is awesome! Fun-fun loving, party going puffle! Girly-what a flirt! Lets go shopping for some makeup and SHOES! Manly-lets go and live in the wilderness and never take a bath! !Then play football!!!! Other-So mysterious it could be ANY of these!! NONE.THEY DON'T EXSIST! HOW LONG DOES IT TAKE TO REALIZE IT IS A TRICK!? Cloeing Of Forum--> opening of blog!! Hi! We are sorry to say we are now officially closing the forum, as it was too much to keep up with. 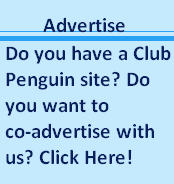 We are downsizing to a blog, which we are calling Club Penguin Kingdom! 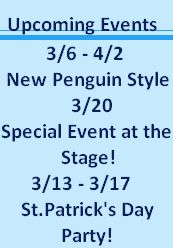 PLEASE visit it~ http://club-penguin-kingdom.blogspot.com/! Thanks!! New Catalogues, Party, Ice Sculptures, Pin and More! Hey alot has happened in just one day!! Look at all this new stuff! Watch the video for catalogue cheats! Catalogues: There are two new catalogues out! The Sports catalogue, which now doesnt have the game-used items, is updated, alond with the ninja catalogue. The game-used sports now get their own little catalogue page, located at each of the game locatations (dock, ski lodge, and cove)! How cool!! 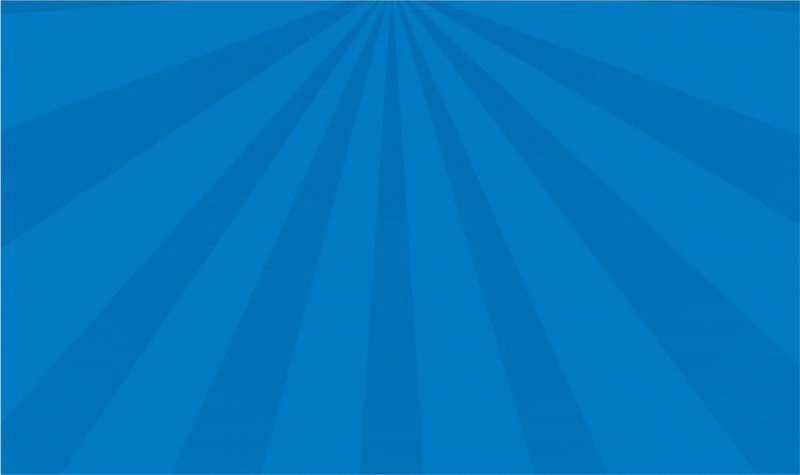 Party: Now nonmembers can enter the party!! Unfortunatley only members can go backstage, where Gary the Gadget guy, the CP band, Aunt Arctic, and Sensi!! 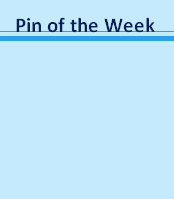 Pin: There is a new pin at the second floor of the ski lodge! Hats off! Its a top hat! member badges and 2 new catalogues tomorow! I hope you are all still enjoying the party!! Catalogues: There will be two new catalogues tomorow: the snow/sports and the secret Dojo catalogue that only blackbelts can see!! Come back tomorow to see the cheats! Member Badges: They have changed the style of member badges so that they reflect how long you have been a member!! I am pretty sure I am still in the first category, but the last one looks pretty cool!! Screenhog has shared with us a preview of the April Fools Party!! It looks like they are bringing back the boxes (with cool looking swirls!) and I can't wait!! Waddle On and Enjoy the party! Hey! The parties are all finally here!!! I can't wait! Here is a short "live" film with PPAs, the new Catalogue, and Ice Contest! PPAs- You can now vote for your favorites!! Ruby and the Ruby, being that i absolutley loved that one, just so happened to be my choice. For all of them. Also if you are a member, head backstage by clicking the "exit" sign and you may just spot Gary the Gadget Guy, Aunt Arctic, The Penguin Band, and Candace, all of which will give you free backgrounds!!! In the Backstage area, you can also click the table of awards to get a PPA!!! How cool! Definitly a cool party. Ice Contest- The first 5 beautiful sculptures have been unveiled!! Check the ski hill bottom, Lighthouse (1st and 2nd floors), Beach, and the Dock to see them! PPAs, Ice Contest... AND MORE! Hey guys! I hope you enjoyed the green party! Get ready for more fun with a ton of stuff starting TOMOROW!! -Quest for the Golden Puffle: Go through a fun myan-themed adventure on the Indiana Jones like quest for the Golden Puffle! -The Penguins that Time Forgot: Go back in time and remember this long ago play where penguins end up in the Jurrasic Era! -Shadow Guy and Gamma Girl: This play and it's sequel with Squidzoid was a Super Power(ful) play that had some awesome costumes!! Snow Sculpture, Going Green Grievences! Hey penguins!! I hoppe you are going green! Happy77 has interviewed the Snow Sculpture team, and Billybob has berought to our attention that there are a few minor bugs for the Green Party! Snow Sculpture Team Interview: "There's tons of excited chatter about the Snow Sculpture Submissions and lots of you are sending in amazing art! With all the buzz, I thought you might want the inside scoop from the talented pair of snow sculpture artists. -What do you look for in all the submissions you get? A great submission is fun, imaginative and makes us smile! But there are so many talented and creative artists playing Club Penguin that they're all making us smile! NEW PIN AT SKI HILL! Happy St. Patty's day! 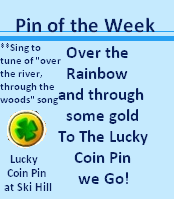 Check out the brand new pin, the Lucky Coin! 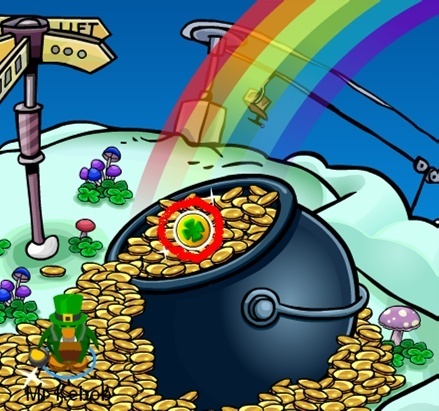 This flashy medallion can be found at the SKI HILL! So, if you don't already have it, go there! I hope you are wearing green!! Or atleast watching for pinchers.... Well, heres the news video! -accordian (MEMBERS) at the SPECIAL leperchauns tree, a members only room. Sorry non members- there isnt alot nowadays that isnt all-members! They are also getting ready for the (MEMBERS) Red Carpet event! Red Carpet Even: On the 20th, the stage is now under construction! Make sure you get the cheats from the clothign catalogue! Well, may the luck of the irish be with you!